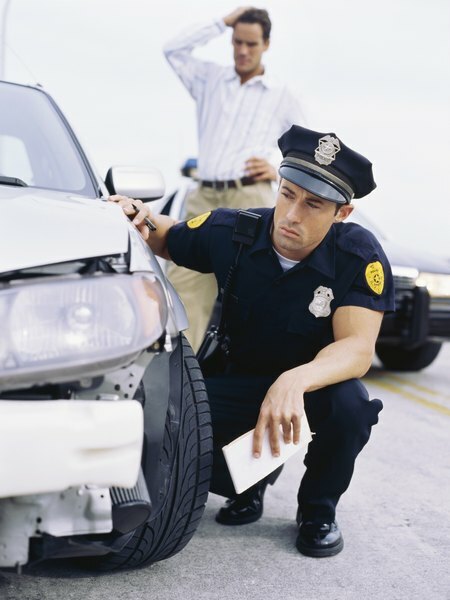 A police report is an essential part of your hit-and-run claim. 2. Can Your Homeowners Insurance Company Cover a Stolen Vehicle From Your House? 3. Will My Insurance Pay an At-Fault Injury Involving Alcohol? Different types of auto insurance cover you against different types of losses. If you cause a traffic accident, your liability insurance pays for repairs to the other party's property. Your collision policy covers the cost of repairing your car after an at-fault accident, and comprehensive covers you against damage to your vehicle that was caused by something other than a collision. It's not so cut-and-dried when it comes to a hit-and-run. Insurance companies refer to an incident involving a driver who causes an accident, then knowingly leaves the scene without providing identification and other pertinent information, as a hit-and-run, which is not as uncommon as you might think. Approximately 11 percent of all traffic accidents involve a hit-and-run incident, according to the AAA Foundation for Traffic Safety. If you come out of the store and find the side of your car bashed in, you might be the victim of a hit-and-run. Unless you can find someone who witnessed the incident, and can identify the individual who caused the damage, repairing your car will be between you and your insurance company. The type of coverage needed depends on how the damage occurred. For example, if someone smashed in your window and stole your radio, your comprehensive policy would cover the loss because comprehensive covers such things as theft and vandalism. If someone backed into your car, then drove off, your comprehensive policy wouldn't apply because comprehensive doesn't cover loss due to a collision with another vehicle. If you are involved in an accident and the other party drives away, your best bet is to write down as much identifying information as possible about the other vehicle and its driver, then contact the police. If the other driver can be identified, you or your insurance company can contact that person's insurance carrier and file a claim for damages. Your collision insurance might cover repairs in an attended vehicle hit-and-run, but you'll still be responsible for paying the deductible. In most states, your uninsured/under-insured motorist insurance covers you against loss from a hit-and-run incident, the Insurance Information Institute said. UIM insurance typically involves a deductible amount, which you must pay before the insurance policy kicks in. The Esurance website notes that UIM can't be used for hit-and-runs in California, Colorado, Georgia, Illinois, Louisiana or Ohio. In those states, you'll need collision insurance to cover you against a hit-and-run. Insure: Will Liability Car Insurance Cover Damage After A Hit-And-Run? SIG Insurance: Parked Car Hit and Run -- Collision or Comprehensive?